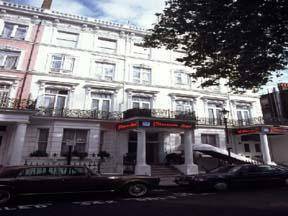 My Place Hotel is an elegant Victorian town house situated in a tranquil Kensington street. It is just a 1-minute walk from Earl’s Court Underground Station and its direct Heathrow Airport link. All comfortable rooms have en suite facilities, a fridge and a flat-screen TV. Some rooms have a separate seating area with a sofa. An inclusive continental breakfast is available each morning. My Place has its own nightclub with a large dance floor, bar and VIP area. The hotel also has a spacious lounge with an all-day bar, and an attractive walled garden with a seating area. Earls Court Exhibition centre is just a 2-minute walk from the hotel, and Kensington High Street is within walking distance. Nearby Earl’s Court has many vibrant bars, restaurants and shops. The hotel also has a spacious private function room, overlooking the hotel gardens.